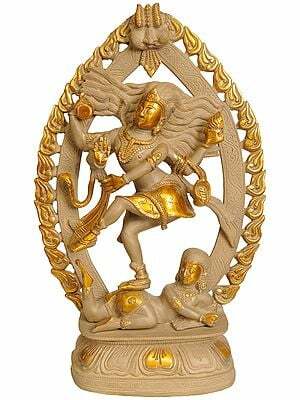 26" X 13" X 7.5"
This twenty six inch tall magnificent brass statue of Lord Shiva is a marvel of iconographic art. 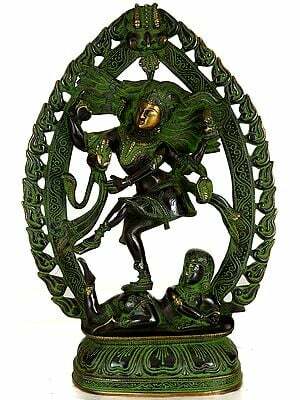 Perfect proportions, exceptional balance, fine details, sharp features, gorgeous but elegant ornamentation and expression of sublimity and calm, characteristic to Jain thirthankara images, define its craftsmanship. 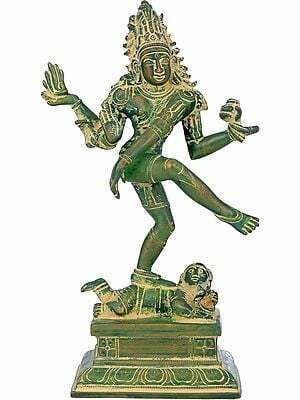 It manifests Shiva in His Tripurantaka dance posture, though blended with elements of other dance forms, His own 'tandava' and Vishnu's 'vishnukrant', it tends to be His 'Natesha' form as well. The gesticulation of 'raudra, the wrath, and the great excitement manifest in his form are obviously the elements of his 'tandava'. 'Tandava' was fiery and accompanied by devastating sound. 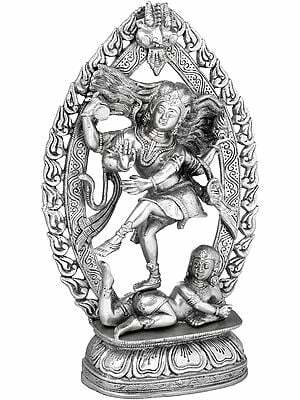 In its visual manifestation, hence, He is shown, as here, holding in one of His hands the flames of fire and in the other a drum. 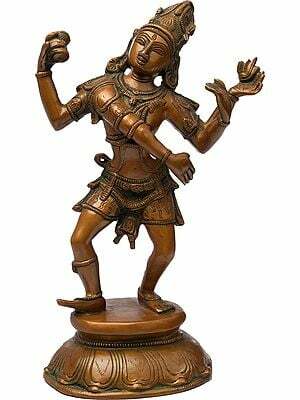 In 'tripurantaka' or even in 'tandava' Shiva is usually four handed but for depicting the multiplication of His movement attaining the cosmic magnitude He has been endowed here with eight hands instead. 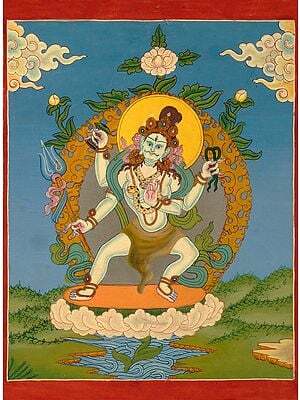 Incidentally He holds in three of His hands a bird, a horse and a bull and carries on His waist a fish. 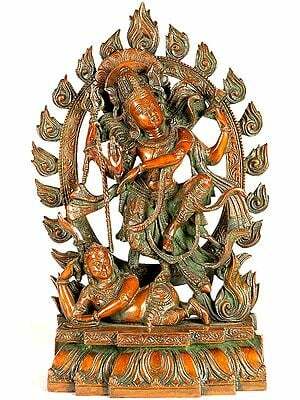 They stand conjointly for earth, ocean and sky, obviously for symbolizing cosmic participation in His dance. 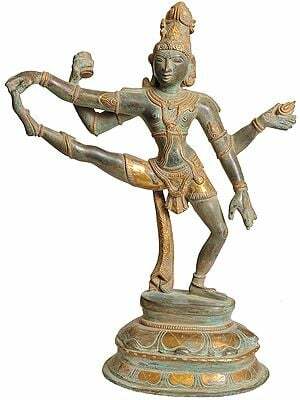 In both, 'tripurantaka' and 'tandava', Shiva is known to have lifted left leg. It was Vishnu who as Vamana, while dancing to span the entire cosmos in two steps, had raised his right leg. 'Tripurantaka' and 'tandava' both rocked earth and tossed mountains. 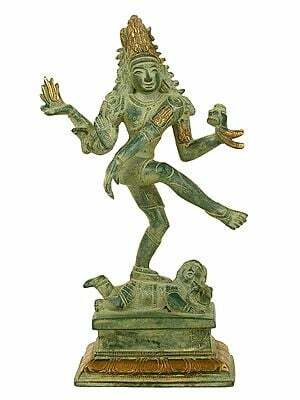 In Vishnu's 'vishnukrant' the earth was contrarily static. It was only His figure that reeled. The artist here had priority for these Vaishnava traits. He preferred a couple of lotuses to base his figure on. Lotus is otherwise too an essential part of Vaishnava cult. The statue thus also represents a synthesis of India's varied religious traditions. 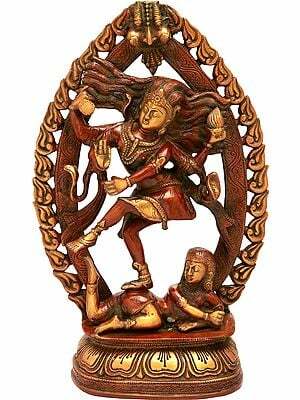 The annihilation of Tripura, a confederation of demons, is considered as one of a very few exploits of Lord Shiva. 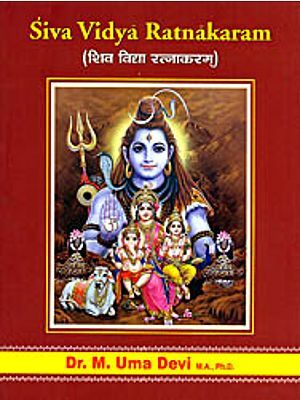 As the scriptural tradition has it, Maya, a demon, built with Brahma's grace and boon three grand cities which could rival Indraloka. 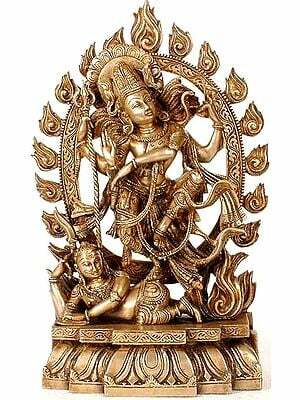 After the cities had been completed Tarakasura, their master, let them into the charge of his three sons, Taraksha, Kamalaksha and Vidyunmali. They were conjointly called Tripura. Maya, before handing over to them the charge of the three cities had instructed them not to stray from the path of righteousness or create acrimony with gods. But the conceited and arrogant Tripura forgot it and began indulging into things which were contrary to the righteousness. 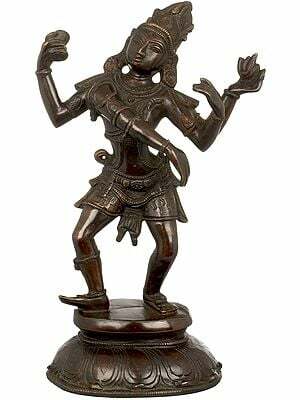 Ultimately Lord Shiva resorted to 'tandava', killed Tripura with His arrows, rocked all three cities with the beats of His dance moves and burnt them with the fire emitting from His third eye. 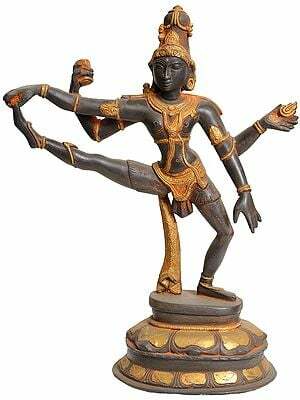 This form of 'tandava', which accomplished 'tripurasamhara' or the annihilation of Tripura, is known as 'tripurantaka', the dance that brought Tripura to an end. 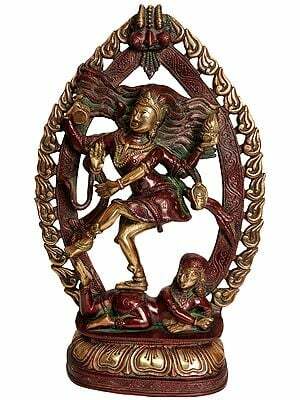 In iconographic representations of 'tripurantaka' Lord Shiva is sometimes seen crushing under His feet a dwarf demon often identified as Apasmara. This is the essential element of His 'tandava'. 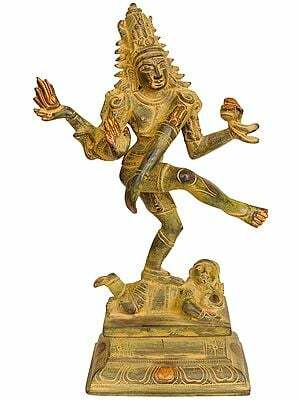 In some early sculptures he is seen crushing under His feet three demons, obviously, Taraksha, Kamalaksha and Vidyunmali, the three sons of Tarakasura. This description by Prof. P.C. Jain. Prof. Jain specializes in the aesthetics of literature and is the author of numerous books on Indian art and culture. 15" X 8.5" X 4.4"